The metabolism of pharmacological compounds by our inhabitant microbes can have a significant effect on drug efficacy. While the best-known example may be the inactivation of the drug digoxin by gut flora1, Klatt et al. recently demonstrated that an imbalance in the healthy vaginal microbiome impacts the efficacy of a human immunodeficiency virus (HIV) drug2. 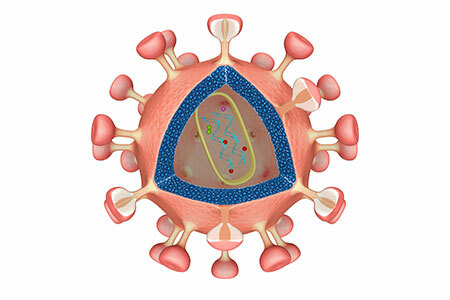 Tenofovir is a mainstay drug in the fight against HIV infection. Although consistent levels of protection are observed in males, results vary in females among different routes of administration2. In the current study, the authors examined the relationship between patient microbiome and the efficacy of vaginally-applied tenofovir gel in preventing HIV infection. In their evaluation, they segregated female participants into two groups based on whether they possessed lactobacillus-dominant (LD) or non-lactobacillus dominant (ND) vaginal microbiota. At study end, despite similar levels of adherence, the researchers found that tenofovir gel reduced the incidence of HIV by 61% in the LD women, but was only 18% lower in ND women compared to their respective placebo groups. After assessing the local levels of tenofovir in LD or ND women, researchers found higher drug levels in LD women. They then aimed to determine if interactions between microbes and tenofovir contributed to differences in drug levels. What they found in vitro was that Gardnerella vaginalis, cultured in the presence of tenofovir, led to significant reductions in the concentration of the drug compared to cultures containing Lactobacillus species. In addition to G. vaginalis, the authors also tested a number of additional ND species and found that they significantly depleted tenofovir. Critically, they demonstrated that the metabolism of tenofovir by G. vaginalis occurs before cellular uptake of pharmacologically active levels of the drug. This study further demonstrates the effect that the microbiome can have on drug efficacy. The authors suggest that strategies that incorporate microbiome screening may be a useful tool to guide and enhance HIV prevention. 1. Lindenbaum J, Rund DG, Butler VP Jr, Tse-Eng D, Saha JR. Inactivation of digoxin by the gut flora: reversal by antibiotic therapy. N Engl J Med. 1981. Oct 1, 305(14):789-94. PubMed PMID: 7266632. 2. Klatt NR, Cheu R, Birse K et al. Vaginal bacteria modify HIV tenofovir microbicide efficacy in African women. Science. 2017. Jun 2; 356(6341):938-945. PubMed PMID: 28572388. ← Can Anxiety Phenotypes Transfer via FMT?